5 Steps to Managing Your Things To Do List! Things to do lists are both the best thing ever and the worst thing ever! They keep us organized and on top of all of the millions of things that we want to accomplish, but at the same time, they can make us feel as if we have so much work ahead of us- that we’ll never get it all done. 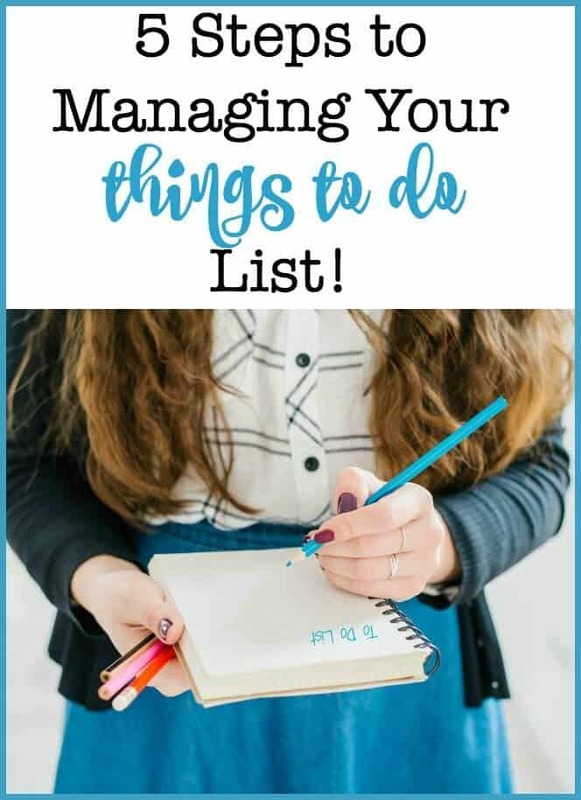 So once we accept that our to do lists are always a work in progress- we can focus on managing our things to do list so that we can feel organized and intentional about how we spend our time. At least until it needs to be done! But honestly, since most of us left a good portion of our brain cells behind when we entered this stage of life called “Mommyhood”, the practice of writing things down has become very important. We need a system that allows us to get it all down somewhere- on paper, on our calendar, in an app (but ideally on something better than the back of a napkin). So the first step in managing your to-do list is to get it all out of your head and onto a list. Keeping multiple lists in several notebooks or on post-it notes stuck to the walls and on your computer leaves you feeling scattered. I recommend making one long master to-do list- one that covers everything you someday hope to accomplish. I suggest that you keep your list categorized by topic- to-dos for around the home, to-dos for your business, etc. When you are staring down a list of 100+ things you’d like to accomplish, there should be an easy way to zero-in on what you need to work on today. A good things to do list should allow you to assign priorities to items. I like to go through each item on my list and assign it a letter A thru C. A's are things that are super-important and that I truly need to get done soon. B's are things I would like to do, but my world won't fall apart if I don't get to them. And C's are “nice to do's” but generally remain on my to-do list for a long time. Of course you have to be able to easily re-prioritize things when you get that call from the school saying you need to come and pick up your child because he has a fever. 4. Assign 2-3 items from your master list to your daily or weekly schedule- but keep it realistic! Pick one to three things each day or even each week that you can realistically accomplish. And assess how long it will take you to get it done. Don’t assign “Clean out the basement”, “Put last year's photos into a scrapbook” and “Dust the baseboards throughout the house” onto this week’s list simply because it consisted of just three things. It is the surest way to get none of this done since you’ve set yourself up for failure right from the get-go. 5. When assigning items to your weekly to-do list, break them down into manageable bites! Re-painting our kitchen has been on my to-do list for a long time now. But to put that on this week's to-do list only sets me up for failure. Instead, I can break it down into manageable steps- select the paint colors, then buy the paint, then tape the trim, then paint one wall, etc. Over time (days or weeks) these bite-sized steps should lead me to achieve my larger goal. This is really a matter of personal preference- and to tell you the truth- at different times I find myself gravitating towards different systems. 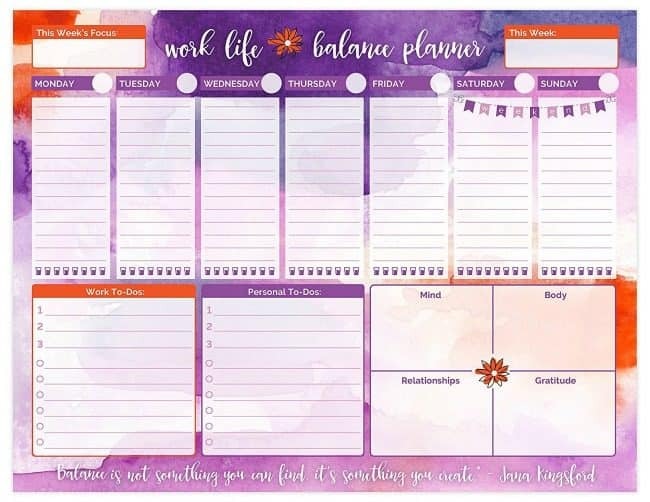 Right now I have my master to-do list on paper, and I am using this work-life-balance planner to manage my daily to-do list. (I absolutely love this weekly planner that is sold as a tear-off pad. I love using the bottom section to set my intentions for the week, and then having a column for each day to plan what I want to accomplish to support those weekly goals). I have also used the To-do lists App (from the App Store) on my laptop which syncs nicely to my Apple calendar (as reminders), and also to my tablet and smartphone so that I can see my to-do list everywhere I go. This is a good place to keep a master to do list as well as set up recurring weekly reminders- for things such as “water the plants” and “give the dog his monthly meds”- things that I honestly forget to do unless it is on my calendar! So please weigh in…. 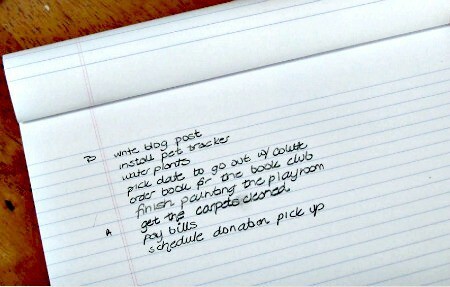 how do you organize your to-do list? On paper, in your calendar, or in an app? And does having an organized to do list help you to get more done? I love the Wunderlist app. It has a downloadable version for your laptop, syncs to ipad, phone, and there’s a web version that’s accessible. It is basic but flexible and allows you to customize. 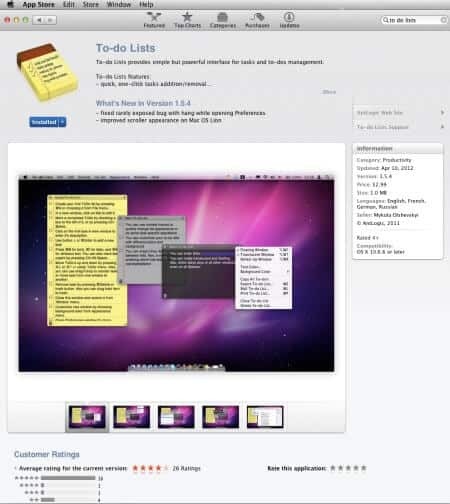 It’s really helped me consolidate and organize all my tasks, and assign dates which help me prioritize. Great ideas on this blog! Just discovered you YouTube videos & your web site!!! 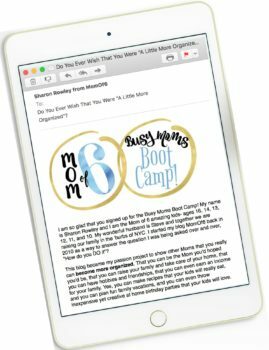 Love the tips, & although I don’t have 6 kids, my girls are VERY busy, which means I’m busy too. My oldest daughter is leaving for college in a year & I’m desperate to save money ANYWhere I can. So I’ve started comparison shopping & couponing. I love your spread sheet on comparing store prices! I’m excited to fill it in, so I can shop smart. So did it take you a long time to fill it in or was you able to get starting prices on line? Any advise would be wonderful! Thank you for your time. i have a daily/weekly/monthly list in our kitchen that i can cross off. For that bigger list…i will go your way=) Perfect!